The year 1992 marked the end of the Mirage TMNT‘s guest creator era: after three years of mostly non-canonical stories by a bevy of creators, Mirage staffers once again took reins of the book, with a new focus on featuring a more stable tone and in moving their characters forward. This latest phase in the book culminated with “City at War”, a thirteen-part mega arc which featured the return of Kevin Eastman and Peter Laird to active creative duties and ended on the book’s last issue. It also gave April some much-needed focus, as the writers had her decide to move to California in order to recenter herself. Perhaps not coincidentally, this era of greater focus on April also saw the beginning of the end of depictions of her based on her issue #4 redesign, as the physical features she had sported since then–by no means limited to skin color–began disappearing. What one may draw from this is unclear, and the fact that there’s only one artist drawing the character for the duration of the era doesn’t help. The years from 1993 to 1996 saw waning interest in the Ninja Turtles. The third film received a tepid reception. 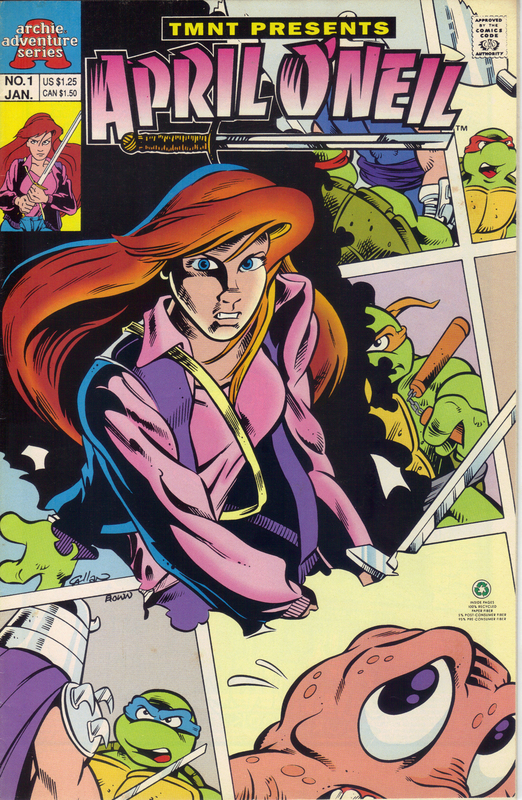 Mirage’s second volume of TMNT, which debuted shortly after the end of the first one,would prove short-lived, its final issue hitting stores on October 1995. The Archie series, TMNT Adventures, ended that same year. After seven seasons of sausage-making, Fred Wolf retooled the original cartoon for its eighth season in order to deal with a shifting children’s television landscape; old characters were written out, new characters were written in, and the series’ aesthetic got a face lift, but none of these changes were enough to stop the series from ending, after ten seasons and 193 episodes, in 1996. By January 1997, the flow new material featuring the TMNT had slowed down to a trickle, and existed mostly in the form of a comic series published by Image, continuing the adventures of the Mirage versions of the characters…but that’s something for another entry. Note the first: While I’ve tried to be comprehensive as possible here, any help obtaining any relevant images I might have missed is much appreciated. Note the second: Despite not having much in the way of comments, I still plan on moderating any discussion with a heavy hand, should it become necessary.